Lancaster at War: Update: Blog Makes the News, Burial Places, etc. Last night, I was pleasantly surprised to learn (via near-simultaneous phone calls from my mother, mother-in-law, and both of my grandmothers) that my post from last week on the Hempfield School District Gettysburg field trip controversy made the newspaper in Lancaster. Jack Brubaker, aka the "Scribbler" and author of an enjoyable local history column that usually has some modern tie-in, quoted and paraphrased my post in his article, "The Value of School Field Trips." Thanks for the attention, Jack! Although my basic conclusion is that both sides have a valid point but the situation is set up to create a mess, I hope it gives Hempfield administrators and parents something to think about...and that one way or another all fifth-graders in Hempfield (and in Lancaster County, for that matter) get to go to Gettysburg. Monday's post was about the 79th Pennsylvania's first soldier to die, Samuel H. Clair, who became sick and died on December 5, 1861, at Camp Negley, near Nolin Station, Kentucky. He was buried in the quiet corner of a farmer's field, and I raised the question of what happened to his remains. After looking at an 1868 government publication entitled Roll of Honor, it appears the government went through Kentucky in 1867 to find soldiers' graves widely scattered across the state and removed remains to a set of national cemeteries. 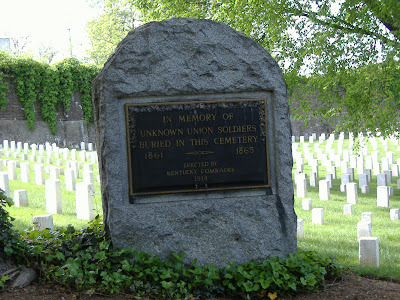 Although Clair's name is not listed, there are many sets of remains classified as unknown which were removed from Nolin Station and Bacon Creek to Cave City Cemetery, Louisville, Kentucky. So my best guess is that he is buried there in a grave marked, "Unknown." If you're like me, you enjoy the Daily Evening Express letters of Corp. Elias H. Witmer, and I've spoken with at least one other person who does. Sadly, Witmer's fate was unknown after the regiment came out of a chaotic nighttime fight at the Battle of Chickamauga in September 1863, although he was presumed mortally wounded and never heard from again. I always wondered though if his family in Mountville did anything to memorialize their son, and found the answer through Find a Grave. By clicking on the link, you can see a picture of his tomb stone at the Mountville Cemetery, which was shared with his brother Abraham, a lieutenant of Company G, 2nd Pennsylvania Reserves, who died earlier that year of disease. Finally, depending on who you ask, the 79th Pennsylvania moved its camp between 1/2 and 1 1/2 miles south along the Louisville & Nashville Railroad on December 6 [WTC, JHD, ASJ]. The move gave the regiment more favorable sod and less mud on which to pitch tents, although they wouldn't stay there long due to orders to keep moving south on December 11.